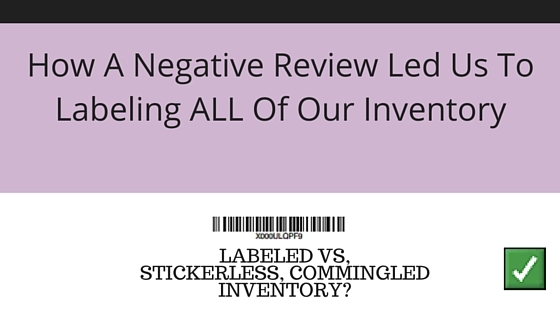 Labeled vs. Sticerkless, Commingled Inventory? However, Nessa and I are very meticulous when it comes to product selection and we NEVER sell products that have been opened and are in poor condition. So, we were a bit perplexed as to why this product was in such rough shape. After immediately contacting the dissatisfied customer to present him with a resolution, we decided to call a meeting and address this issue and outline our go forward strategy. But first we evaluated the 2 options before coming to a conclusion. When you send your first shipment to Amazon, they will ask if you want to opt in for Labeled or Stickerless inventory. Just as it sounds, labeled inventory requires you to print and label each unit that you ship to Amazon FBA. These labels not only identify the product, but they identify the seller. So YOUR exact product is associated with YOU! FYI, even though you may have never changed the default of Stickerless, Commingled Inventory, you will still be prompted from time to time to label your products. It just depends on the item. Everytime you sell an item, it comes directly from your inventory and not from some commingled vat. Therefore, you know that your high standards of quality control will be rewarded with positive reviews, due to high customer satisfaction. Should there be an issue, you can always confirm that the product(s) shipped were actually yours. Longer shipping time. Since your product may only be in one FBA warehouse, it will be harder for Amazon to fulfill those 2-day Prime shipping orders, hurting your seller metrics and potentially leaving you out of the buy box more often than if you were selling commingled units. This inventory labeling method allows sellers to send in their products unlabeled, and all seller’s’ products of the same ASIN get put in this commingled pile. Don’t have to spend time and money printing and labeling products. Helps Amazon place “your” inventory closer to customers, getting orders to customers faster. Which could potentially mean you get into the Buy Box more often. Your inventory gets mixed in with other sellers’ inventory. Now, your “quality control” is just about as good as the worst seller, with minimal to no quality control standards. So you may just find out, like we did, that not all sellers are as meticulous as we are. And when you sell something, that product could very likely be from another seller’s lot and be all jacked up. If you happen to check out Amazon’s page for Labeled Inventory versus their page for Stickerless, Commingled Inventory, one could draw the conclusion that Amazon prefers sellers to opt into Stickerless, Commingled Inventory. That’s because they can pull these products from the FBA warehouse closest to the customer, leading to faster shipping times. Something that Amazon is all over! That said, as much as shipping speed helps your Buy Box metrics, negative customer reviews will get you in big trouble with Amazon. And, with enough negative reviews, I’m sure Amazon wouldn’t hesitate to suspend your account entirely. Therefore, Nessa and I have decided to move forward with Labeled Inventory. We know that the opportunity to prevent these negative reviews and defective returns far outweigh the less favorable Buy Box metrics. Again, with enough positive reviews those depleted seller metrics won’t matter as much. For us, it is super important that the customer gets the best experience possible and this is just one of the many ways that you can insure that you are well represented as an Amazon seller with integrity. Now, we’ll see if we notice any adverse consequences for choosing this method. But we are pretty darn sure that this is the best way to go for those sellers that are looking to make a long-term business out of Amazon. Let us know your opinion on this topic by posting in the comments section. We’re always interested in what you have to say. That said, we did have one remnant encounter with one of our last commingled batches. Here’s the short story. So, we sold this product in July and in August the customer returned it because he “Accidentally ordered the wrong item.” Upon getting it back from Amazon, we immediately realized that the product wasn’t in the box. It was just a hot mess of random metal parts to give it some weight. Since this was commingled inventory, there’s no way to know if a shady seller shipped this in or if the customer pulled the old switcheroo on us. Even though we were reimbursed by Amazon for this unit, it still reinforces the fact that labeled inventory is the way to go!